President Lee In-ho of Korea Trade Insurance Corp.(K-SURE) gives his speech at his inaugural ceremony held on Jan. 2 at the company’s auditorium in Seoul. 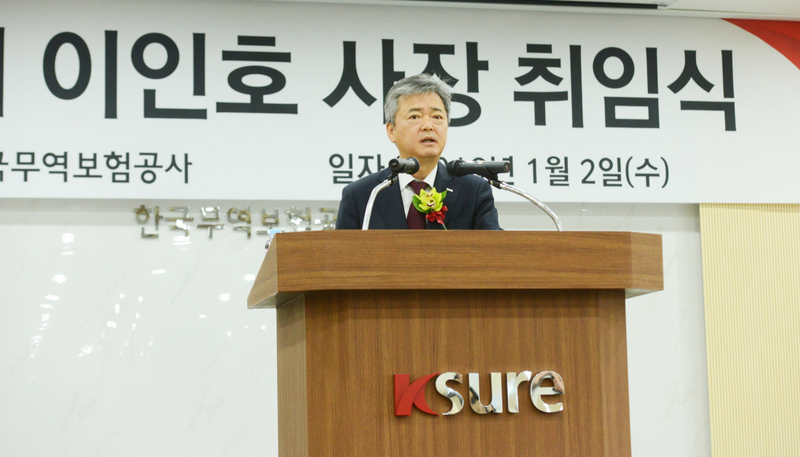 President Lee In-ho of Korea Trade Insurance Corp. said K-SURE will seek out companies taking on reformed growth and help them lead that to pave the way for business firms to go overseas. The former vice minister of the Ministry of Trade, Industry and Energy, who assumed the top position at the trade insurance firm on Jan. 2, warned that the prospects for exports this year are not bright, due to rising levels of protectionism around the world, although last year the country’s exports topped $600 billion for the first time. “We will be at the forefront of exploring new export markets for the Korean products.” the new CEO of the trade insurance firm said. He also said K-SURE will do everything in its power to provide better services to its customers by employing such new technologies as Big Data and AI in its customer-friendly systems. The new K-SURE CEO called on his officers and staff to let go of their old ways of thinking and be confident in their jobs so K-SURE can become a company for the people in the country. Korea Trade Insurance Corporation was established in July 1992 upon the Trade Insurance Act for the goal of promoting trade and overseas investment of Korean enterprises with the mission to boost the national competitiveness. As the official export credit agency under the Ministry of Trade, Industry and Energy, our business scope is as follows: Operation of various trade insurance programs to cover the risks arising from the export and import of goods and services, overseas construction works and investments, management of foreign exchange and interest rate fluctuations, export of cultural contents and services, and other overseas transactions. Sound management of the ‘Trade Insurance Fund’ through the trade insurance underwriting ceiling approved by the National Assembly and the integrated risk management system. Korea Trade Insurance Corporation announced that it would provide $36 million of financing for the Daehan Wind Power Project of Jordan, which is participated by Korea Southern Power Co. Ltd. (KOSPO) and Dealim Energy of Korea. This project is an independent power generation project proceeded in the Build-Own-Operarte model to build a 51.75MW of wind power generation plant with total $100 million of project amount in Tafila, a town 130km south from Amman, the capital of the country. For the project, K-SURE will provide finance with the International Finance Corporation, a member of the World Bank, to successfully bring out the collaboration with the international organization while providing Korean financiers such as Shinhan Bank with a chance to joining major investment development projects, which has been dominated by foreign financial institutions.